Where, exactly, is the pressure on British Labour leader Jeremy Corbyn to condemn the Venezuelan government coming from? Image: Jonathan Alvarez C, Wikimedia/Creative Commons licence. Hard to imagine a better example of Chesterton’s barb than the unremitting assault on the current Venezuelan government by much of the western media. They parrot the critical howls of politicians and pundits whose opinions they might otherwise view with scepticism, among them Donald Trump and Michel Temer, the unelected president of Brazil. Even Pope Francis has come out against Venezuelan President Maduro’s “regime”, but then the Catholic Church has a track record in these matters. It also sided with the Chilean military in the coup against Salvador Allende’s government in 1973. No one can credibly dispute that Venezuela is in a mess. Reasons to criticise the ineptness of the Venezuelan administration are not hard to find; though the same could be said of plenty of others, including the current inhabitants of 10 Downing Street and the White House, who in their respective elections failed to win over the majority of eligible voters (May) or even the majority of actual voters (Trump). Nevertheless, Venezuela is a functioning democracy with an elected president whose term ends in 2018. Should Maduro stand again, he can be democratically defenestrated, and there has been no suggestion that the next election will not take place on time. Why, then, the calls for regime change? Whence the hostility of the international media? Why, above all, is the Venezuelan government being tasked with acts of violence for which the Opposition is largely if not entirely responsible? It is the latter that has been firing on public buildings, attacking medical centres, erecting street barricades, destroying or blocking access to polling stations, using molotov cocktails and roadside bombs against police and security personnel, and horrifically burning alive the odd “Chavista” in broad daylight – aggressions that have been caught on camera – often by passers-by. Such outrages would be termed ‘acts of terrorism’ in the countries now calling for Maduro’s head; and the perpetrators would be in jail. Over 3,000 arrests followed the 2011 riots in England with nearly 1,300 receiving prison sentences. Politicians and media alike called them “criminals”. Their more vicious and deadly Venezuelan counterparts, on the other hand, receive billing as heroic “political prisoners” confronting a repressive regime. Notable among these heroes are Opposition leaders Leopoldo López and former Caracas mayor Antonio Ledezma, both currently under house arrest for fomenting street violence – the former having already been tried and convicted in 2015 of responsibility for inciting riots that led to over 40 fatalities. Among the most egregious and disappointing purveyors of disinformation on Venezuela is the BBC. On 29th July, BBC News broadcast a truly virtuoso piece of misrepresentation in which most of the interviewees were young rioters wearing masks, though viewers were also treated to a smorgasbord of anti-government slogans from Opposition activist María Corina Machado. Machado was a signatory to the attempted coup against Hugo Chavez in 2002 and has worked tirelessly ever since to overthrow his successor - including appealing for US intervention. BBC Newsnight on August 7th treated viewers to an interview with Juan Andrés Mejía who was introduced as the leader of “Popular Will” a Venezuelan political party supposedly “of the left”. Mejía - a Member of the Venezuelan National Assembly - recited the standard Opposition line, accusing the Maduro government of murdering and torturing hundreds of civilians, a charge for which no-one has been able to offer plausible evidence for the simple reason that it’s untrue. (Though the situation is fast-moving, and recent reports suggest that there have been three deaths definitely attributable to police or law enforcement officers, and that all three officers have been arrested are reported to be awaiting trial). What the BBC failed to mention is that Mejía’s constituency in Caracas is the wealthiest in the country. That his party was founded not by him but by the aforementioned Leopoldo López. That its raison-d’être was and remains to organise “La Salida” which, in plain English, means toppling the government, and that it is a member of MUD - the Opposition coalition. In place of host Evan Davis’s usual forensic interrogation, Newsnight’s Venezuelan guest received a green light to pile lie upon falsehood with no other restraint than the time allotted for the interview. On the following morning, BBC Radio 4’s Today Programme - scraping the barrel for Venezuelan pundits - came up with Gabriela Montero, a classical pianist and composer who lives in Barcelona but happens to have been born in Venezuela. A safe choice, she dutifully trotted out a handful of Opposition clichés of the kind available for a pittance on the newsstands or free of charge over the airwaves and on the Web. Not once has the BBC bothered to interview what are known in Latin America as “el pueblo”, the people - trades unionists, rural workers, the disabled, indigenous peoples - who make up the bulk of the population and who are all represented in the recently-elected Constituent Assembly. Domestically, the assault on Venezuela’s government and the “Bolivarian Revolution” comes from the traditional masters of the country and its economy - the wealthy elite whose younger members have been busy over recent months erecting street barricades and causing mayhem while the elders ramp up the political rhetoric and employ their control of key business sectors to generate shortages of essential goods, notably in the working-class areas of the main cities. Such shortages are in striking contrast to the wealthy neighbourhoods where supermarket shelves remain full. Shortages are useful to the Opposition because they are seen as a means of weakening support for the regime. Getting the poorer classes to vote or to act against their own interests is a prime tactic of the neoliberal right. Governments invariably take the blame for popular misfortunes regardless of how they are caused or who may be responsible. 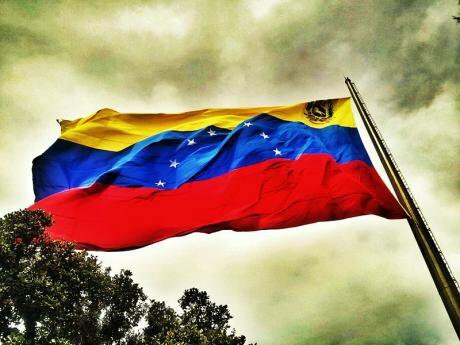 Venezuela has become a target of international concern for two main reasons. First, it has the world’s largest oil reserves - currently estimated at 300 billion barrels. Despite the impact of fossil fuels on the global climate, oil deposits of this magnitude give the country a strategic value similar to that of the Middle East. Successive US administrations have therefore looked askance at the efforts of a ”left-wing regime” under Hugo Chavez and now Nicolas Maduro to strengthen economic and political ties beyond the western hemisphere. Evidence of those efforts is a surge in Chinese support for the Venezuelan economy in the form of both loans and investment. As recently as June this year, planning minister Ricardo Menendez revealed that high-level discussions were underway to increase further Chinese involvement in Venezuelan agriculture, industry and technological development. Second, Venezuela’s Bolivarian Revolution - were it to succeeed - might offer an example that another world is possible and thereby contaminate the opinions of voters in Latin America and beyond. Only Bolivia, Cuba, Ecuador and Venezuela remain as hold-outs for the left in Latin America. Last year, a congressional coup in Brazil removed left-wing President Dilma Roussef from office and installed a right-wing replacement - with no election in prospect. There have been coups against left-wing presidents in Paraguay in 2008 and Honduras in 2009 and a probably fraudulent election in Mexico in 2006 that kept left-wing radical Andés Manuel López Obrador from getting the keys to Los Pinos - the presidential residence. In Chile the left is constrained by a constitution framed under the military dictatorship of Augusto Pinochet that makes changes virtually impossible. Venezuela is by far the most significant hold-out for the left, from the West’s point of view. It is suffering a major assault not just on the Maduro administration but on a political project - the Bolivarian Revolution - that for the first time in Venezuela’s history has given the poor access to health care, education and the prospect of dignified participation in the nation’s economic life. That assault is being orchestrated by the wealthiest sections of Venezuelan society with the overt backing of the United States , the European Union and much of Latin America. Should it succeed, it will be a triumph not for democracy but for neoliberal capitalism, and for government by the one percent. Such is the context of calls from Tories and from UK media for Jeremy Corbyn to condemn President Maduro. Corbyn is right to resist them. Venezuela’s struggle is also ours.